Start your Dropshipping Shopify business. 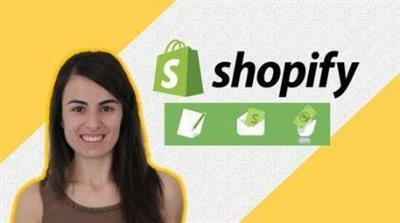 Build a highly converting store using Shopify the best eCommerce platform. Shopify is currently the most famous ecommerce platform and it is without any doubt the perfect solution to easily build your online store, without any coding, in less than 2 hours and with the lowest cost possible! The ecommerce marketing continues to grow year after year! Building an online store offering and selling goods or services is a very trendy business nowadays. And The road to creating a successful online store can be difficult if you do not have the perfect tools to do it! Without previous experience in web designing and development, many people worry that they will not be able to start their own store without paying for a professional or struggling with lots of complicated procedures and steps! But do not worry! If you're thinking of creating your own online store and don't know how to do, it then this course is the perfect solution for you. In this course, I will show you step by step how to build your online store using shopify, the best and easiest ecommerce platform ever. And since building an online store is not your only goal, but your true and golden goal is to have a store that converts well and brings you money, I am going to show you in this course all the methods that I know that will help you increase your store's conversion rate, therefore your revenue! In this course, you will get familiar with the shopify dashboard, and I will teach you step by step how to build your own store. You will learn how to pick your store theme, how to modify it, how to create your own brand, how to design your pages especially your home page, how to add products and optimize them and how to tune your store elements and settings. Gradually, I will show you the core elements that I use to increase the conversion rate and how to add them to you store. Together we will see how to create urgency on your shopify store and on your checkout page by adding count downers, "number of items left", social proof popups and many others elements. In addition, I will show you how to connect with your leaving customers or your previous customers via an email marketing system. By the end of this course and starting of tonight, you will be able to build a highly persuasive shopify store that will help you move your business to the next level. Cash on this opportunity now, start your own well optimized highly converting shopify ecommerce store with me and let your dream becomes a reality. Build highly converting shopify Store in 2 hours & 0 coding Fast Download via Rapidshare Upload Filehosting Megaupload, Build highly converting shopify Store in 2 hours & 0 coding Torrents and Emule Download or anything related.